Photo Credit: Tom Schaefer A fumarole on the slopes of Mount Erebus is the tell-tale sign that there is gas seeping from underground. 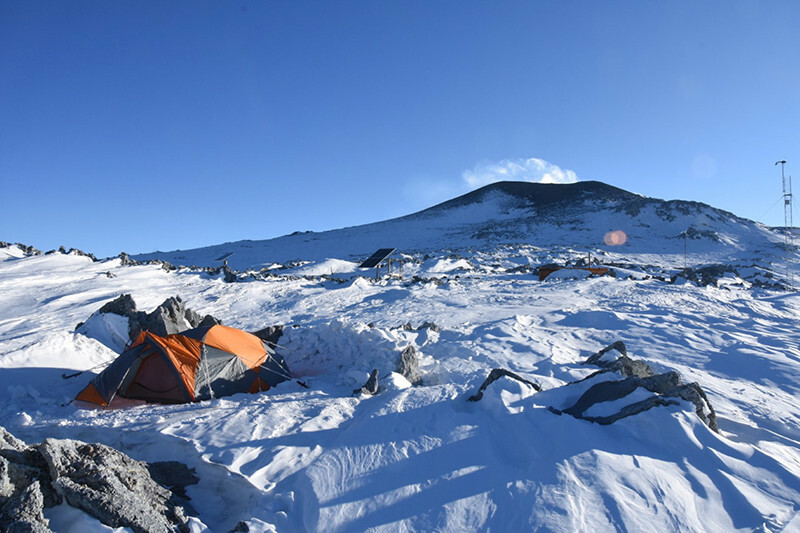 The team camped on the side of Mount Erebus, who’s smoking crater can be seen in the background. All over the world, plumes of gasses that formed deep under the planet’s surface, pour out of active volcanoes and mix with the atmosphere. 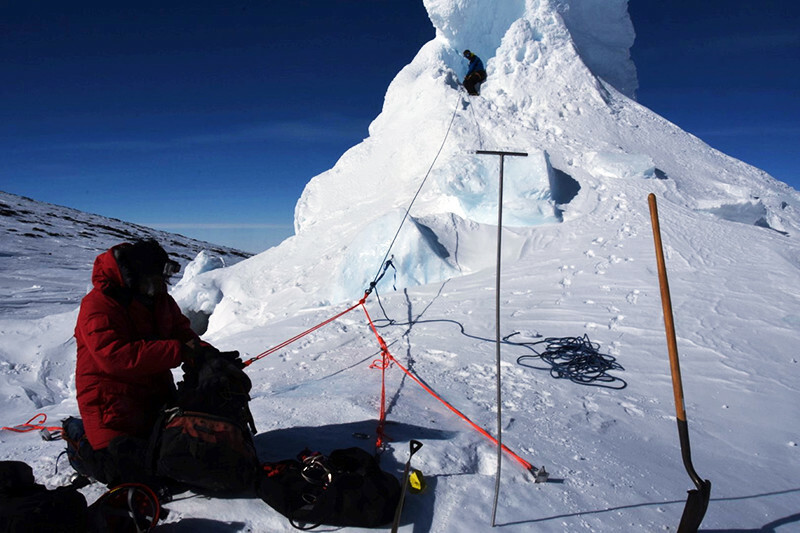 Tobias Fischer, a volcanologist at the University of New Mexico, spent two seasons exploring the frozen face of Antarctica’s Mount Erebus, the world’s southernmost active volcano, to better understand these fumes escaping from the depths of the Earth. He and his team traveled to Antarctica to take the closest look yet at the gasses seeping out of the slopes of the volcano. Their project is supported by the National Science Foundation, which manages the U.S. Antarctic Program. Scientists have been studying the fumes pouring out of the open crater at the peak of the mountain for years, Fischer’s is the first major attempt to understand the gasses coming off the sides, or the flank, of the volcano. They want to get as complete a picture as possible of all the emissions emanating from the mountain because they likely played a major role in Earth’s prehistoric climate. The gasses are the product of the Earth’s solid outer crust melting deep below the surface. At depths of several miles, the Earth’s rocky crust contacts the red-hot mantle. The extremely high temperatures and pressures at those depths liquefy the crust, releasing a range of gasses in the process. Mountaineer Tom Schaefer stands in front of a fumarole, an ice tower formed when water vapor refreezes into frozen tower. What seeps out is a mixture of carbon dioxide, sulfur, water, nitrogen and the noble gases, some of which are common in normal air, but in very different proportions. They flow up to the surface through the same magma tubes that carry the molten rock up to crater of the volcano. Measuring this flank degassing on volcanos in other parts of the world is difficult because it’s hard to spot where the invisible gasses leak out of the ground. However, because a thick sheet of ice covers Mount Erebus, these warm gasses carve out spectacular ice caves and ice towers that pinpoint exactly where these seeps are located. 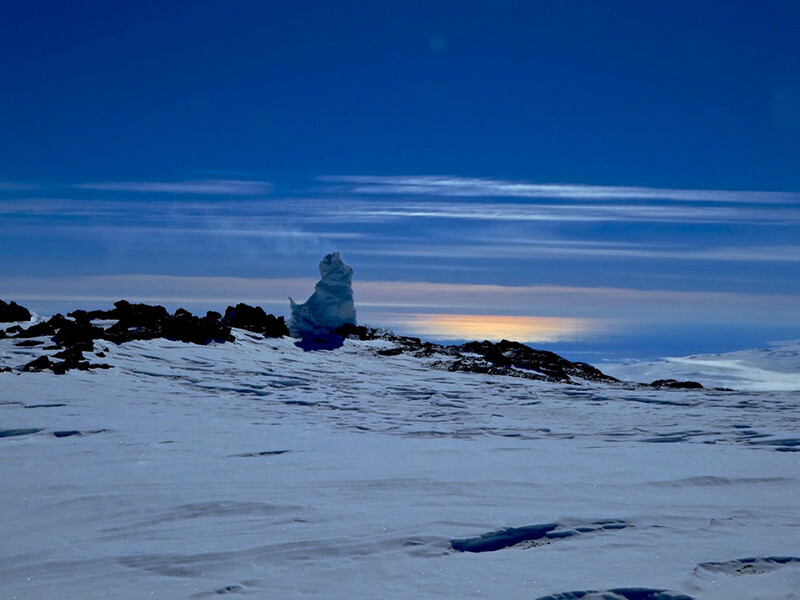 “Mount Erebus is the ideal laboratory volcano,” Fischer said. Postdoc Tehnuka Ilanko of the University of New Mexico and mountaineer Tom Schaefer prepare to climb into a fumarole. As the warm vapors rise out of the ground, they melt the overlying ice. 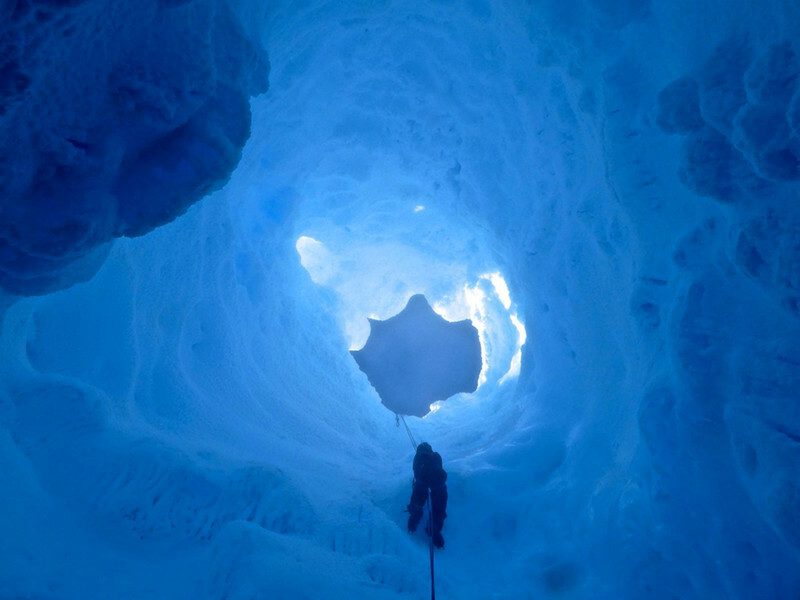 This can create the dramatic ice caves that pockmark the sides of Mount Erebus. 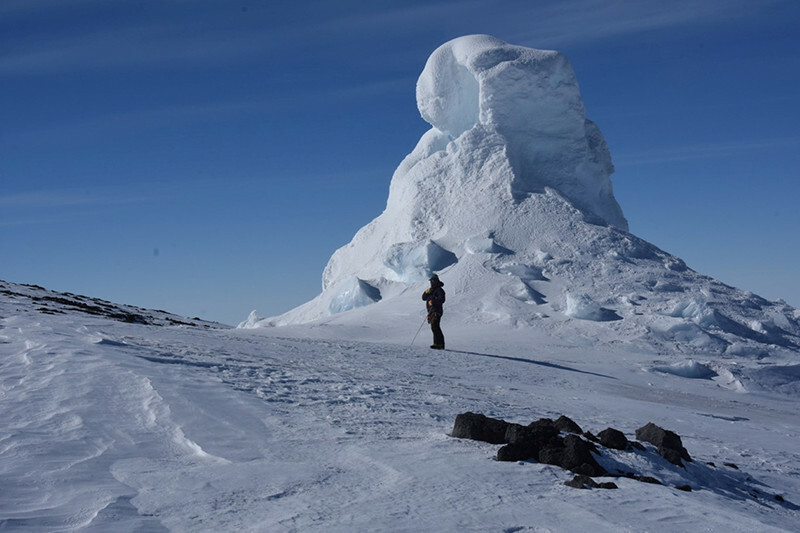 If the gasses are particularly hot, the water will evaporate and then refreeze where it contacts the cold air, forming giant ice towers called fumaroles. Fischer and his team climbed into a number of these caves and fumaroles to sample the gasses that created them. 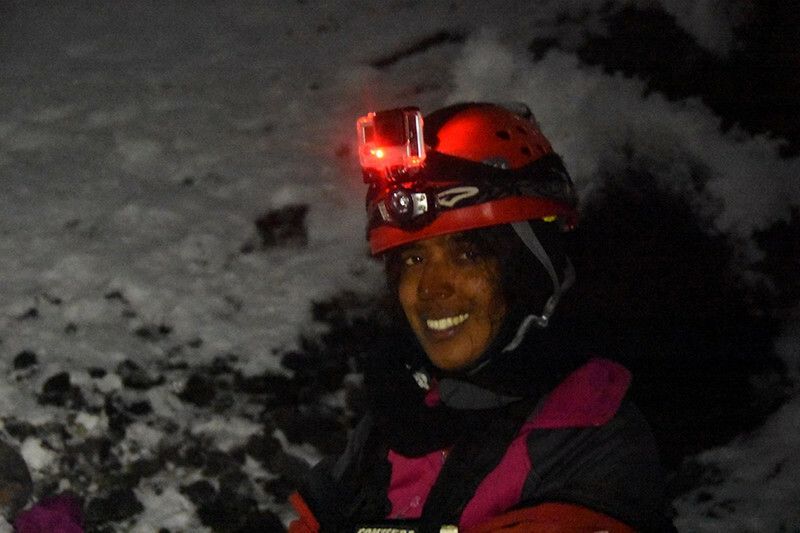 Inside the caves, the team looked for areas on the ground that were devoid of frost, the surest sign that warm gasses were leaking out of the rocks at a particular spot. Mountaineer Tom Schaefer descends down into a fumarole. “In the caves there are these areas that are warmer areas, but [the gasses] are still really hard to collect because it’s very diffuse and to make the measurements in the caves is challenging,” Fischer said. When they found a spot with seeping gas, they would insert a probe into the ground connected to a pump. It drew in the emissions and pumped it into the team’s sampling vials to bring back to their home institutions for analysis. They also brought along an infrared spectrometer that they kept at camp. With it, they could immediately analyze the carbon dioxide levels of the gasses they collected. The team set up sample collectors next to spots where gas was seeping out of the ground in the ice caves. Though he’s studying all of the gaseous emissions, carbon dioxide is of particular interest to Fischer and his team. It’s a way to better understand how this carbon dioxide emitted by volcanoes affected Earth’s ancient climate. Carbon dioxide is a greenhouse gas that traps heat from the sun in Earth’s atmosphere. The more carbon dioxide concentrated in the atmosphere, the more heat gets trapped and the warmer the climate gets. Postdoc Tehnuka Ilanko of the University of New Mexico worked with Fischer to sample the gas inside the ice caves. The team collected samples from ten different caves and is in the midst of processing and studying them. Already they encountered some surprising preliminary results. The team found isotopic evidence that some the carbon dioxide they collected seems to be coming from different sources below the surface. The main source is likely directly from the magma deep underground, as expected. 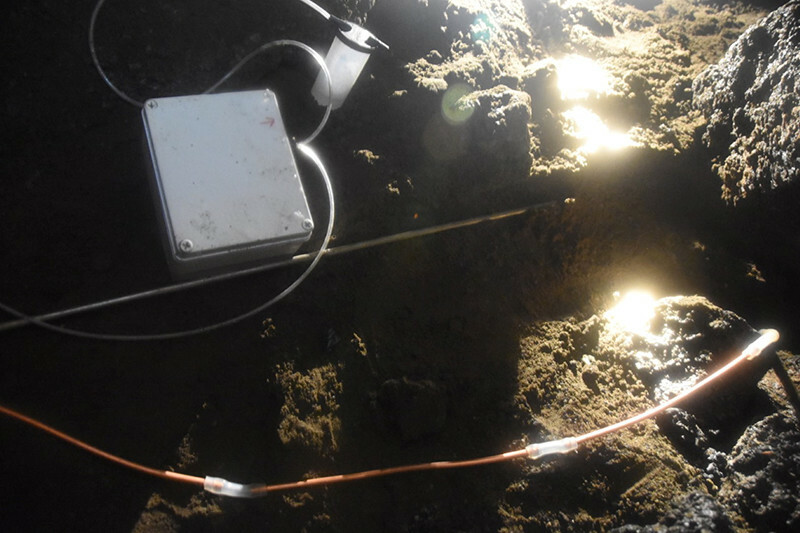 However, in a few of the caves they found carbon dioxide with an isotope signature that seems to hint that it was created by some other underground process. The team is continuing to study and map where these unusual samples came from on the mountain. It’s still too early to tell for sure what’s casing these anomalous results, but the results are tantalizing, and could lead to new directions for future research. NSF-funded research in this story: Tobias Fischer, University of New Mexico, Award No. 1443633.